Written and posted by Kelly Anne Gould of Travel Impressions. Continuing the exuberance of the saxophone opening act, dinner brought the show to the cooking at Zen, the hibachi restaurant on the hotel’s family-friendly Hacienda side. Listening to the waiter review our menu, my stomach sank as I realized it involved meat. But a word to the waiter and chef, and vegetarian options were swapped in without hesitation —just for me. One person in a group of about twenty. Our waiter was also quick to tell me which of the sauces to avoid, since one contained peanuts, which I’m allergic to. (For other food allergy-sufferers, leave your fears at home; every single restaurant asks every guest if they have any allergies, every time.) Rather than making me feel like an inconvenience, I felt like a VIP. The first course, a neat row of sushi, was “rolled” out as our chef, Hamachi, introduced himself with a big smile. Under his practiced hands, the grill blazed into life with a five-foot-high flourish. Joking as he worked, egg whites turned into hearts, stacks of onion into a “choo-choo,” and our appetites, sated. My entree — carrots, snow peas, broccoli, cauliflower, mushrooms — was cooked before and totally separate from the others’ shrimp and beef, an extra effort I appreciated. For dessert, I once again had my own personal creation: Asian-fusion panna cotta, elegantly adorned with sour plum. Just one more example of culinary excellence and adaptability. 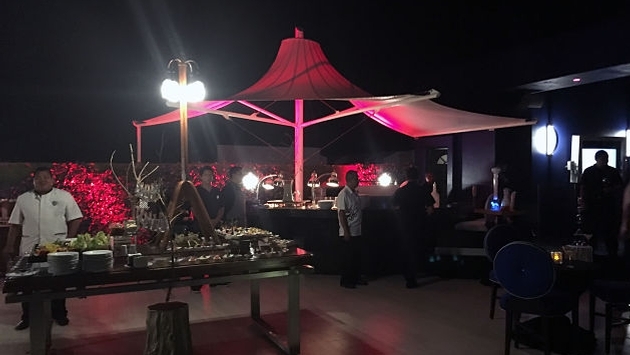 … A theme upheld at the next night’s show-stopping farewell dinner, presented in true rock star style on the rooftop terrace of the Bret Michaels Rock Star Suite. The brand’s first celebrity-inspired accommodation and the crown jewel of the Rock Royalty section (the Hard Rock Hotels version of club level), it delivered on that promise and then some. Over 9,000 square feet, created in partnership with Poison’s legendary singer, unfolded into a massive foyer; two opulent bedrooms; two full baths plus two half-baths; a Guitar Hero game room; working photo booth; dining area; music room with stage; and full bar immediately serving drinks. Memorabilia dominated the walls. Yet up on the roof, the terrace turned the power up even more. Small plates of delectables destined to end up on my Pinterest lined two long tables; a separate serving area offered vegetables and meats just off the grill. Giant, glowing statues made a horn-sign pathway to a hydro-tub for at least ten, fire pit and loungers. Even a designated hookah area had been arranged. Unsure how the night could possibly get any better, nonetheless we set off for the encore: Club Heaven. Toasting the good company with Moet & Chandon Champagne, we watched from a private table as records and dancers spun in sync and lights reflected off the pool. Yes, the pool (! ), sprawling from the DJ stand right up to the dance floor, perfumed mist unfurling over it like smoke. It seemed unreal that this was our group’s last night together, but that was the only thing that felt out of place. The Hard Rock Hotel Riviera Maya has a way of making you feel like this was normal, everyday life; that you were a rock star all along, and the staff just helped you realize it. It’s no wonder here an occasion becomes a special event.